It’s been a busy 1st half of September for KIS Coaching Athletes. With many of the gang coming into top form, it’s starting to show on the results board! Let’s first take a look at the first weekend of September and what our athletes accomplished. Out in Santa Cruz at the 70.3 Santa Cruz, formally known as the Big Kahuna Half, Richard Kane finished his year with a 26th place in the 45-49 division to conquer the challenging Bay Area course in a 4:48 (Shortened swim due to fog) Congrats on another great year Richard! Unfortunately, Daniel Del Real had a mechanical on the bike with a double flat which ended his day, but he will bounce back and finish of 2017 with Levis Gran Fondo! In the Mid West Coach Scott was back in action at Ironman Wisconsin just a few weeks after finishing Embrunman. His assessment is that it was a solid day, not good, and certainly not great but finished 9th overall in just a few seconds over 9 hours to earn $1000. But what it was is another positive step in the right direction. Scott would like to use himself as an example of how much hard work and patience it takes to race at your top level. While his 2:54 marathon may seem rather quick to most, it is 10mins + slower then where he should be…But having been unable to run earlier in the year he is behind in fitness but 4 weeks ago he was able to run 12 strong miles in Embrun and on Sunday he made it another 10kms before the wheels came off. So as his mentor Brett Sutton would say, ‘Patience Grasshopper and the Force Will be With You!” look for Scott to start 1 more Iron Distance race before the year is up. Further East along the Northern Border in Lake Placid the Staten Island Stallions, Michael and Cheryl Bergeron, along with Steffan Manno raced the inaugural Lake Placid 70.3 as their final race before Ironman Louisville. Cheryl struggled a bit in the cold wet conditions but never gave up finishing in just under 7 hours. Michael fared a bit better after sitting on his Mrs. feet in the swim to finish in 5:47 setting a new PB for the half marathon off the bike. Steffan tackled a tough course for his first 70.3, but he finished in 6:12 and is excited to do another 70.3 in the near future. 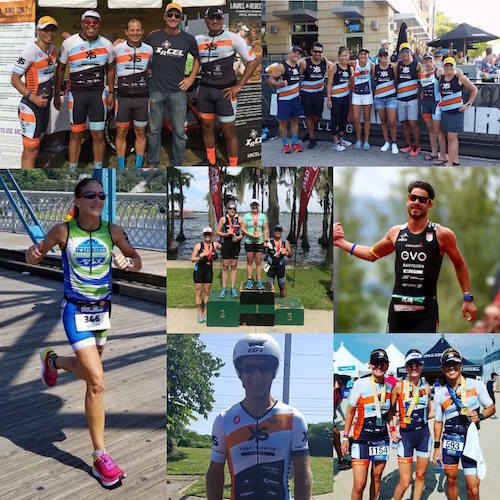 Over at the White Lake Half Ironman, Caroline Gaynor was once again back in action giving back to the sport of triathlon and guiding Randi Strunk to the finish line of her 2nd Half Ironman. Randi has also just joined KIS Coaching and will be targeting IM Texas as her first IRONMAN next year! Caroline is prepping for the IM World Champs where she will guide a visually impaired athlete there. Finishing the week we want to say congrats to all 14 of our athletes that qualified and raced at the 70.3 World Championships! This year saw the very first time that WTC used a split day format giving the ladies first opportunity to get around the very challenging course in East, TN on Saturday morning. The men followed Sunday AM. The initial response has been super positive so kudos to WTC for really going out on a limb to improve our sport! Lets hope we see more of this kind of format in future races! Congrats to the following athletes that raced to the best of their ability on the day! And a Special mention to Niels Vande Casteele that not only had an incredible day to finish 8th in the 30-34 Division in 4:21. But Niels has been quietly working on a partnership between the Ironman Foundation and the Crohn’s Colitis Foundation. You can read all about it in the article below. Not only is Niels a world class athlete but he is an example of what it means “DO MORE THAN SPORT”! This past weekend Manu Kung kicked things off racing at 70.3 Weymouth. Despite a mechanical setback on the bike Manu battled on to finish 5th overall in 4:13 over the challenging UK Course. Well done to Manu who earned another $500 for his effort Also in Weymouth was Taylor Rogers who wrapped up his 2017 season with 3rd in his Age Group and punched his ticket to the 70.3 World Championships in 2018. Amelia McCraken is your Toughman NY Female Champion. Amelia did very well to get around the super tough, Toughman course in 5:20:07. Great job considering she helped pace a friend through a marathon just 7 days prior. Congrats on the win Amelia and well done to pick up $1500 for your effort! Over in Texas we had Christa Lopez and Glenn Merkel racing the Disco X-50 Triathlon & Aquabike. Christa took 2nd in her Age Group and got in a solid day in prep for her fall IRONMAN. Glenn was coming off of 70.3 Worlds and opt’d for the AquaBike where he took the OVERALL WIN! Coach Sam, Fred Redd, Glen Lee, and Aldo Eguia. Coach Sam led the way to finish in 5:02:02 and qualify for the 2018 70.3 World Championships in South Africa. Aldo Eguia gets most improved by taking off another 34mins from his 70.3 P.B. Great job Aldo! Fred and Glen held things together quite well considering they are in the middle of training for Ironman Cozumel Fred just missed getting under the 7 hour mark in 7:03:11 and Glen was a bit further up the road in 5:44:45. Excellent effort boys! Finishing off the week we saw 3 of California’s newest transplants race amongst the celebrities at the Malibu International Triathlon. Chris Depetula and Olga Lech touched up on their speed while also training for Ironman Cozumel finishing in 2:29:51 and 2:45:26 for 15th and 12th in their age groups. Veronica Finished off her season to place 5th in the 30-34 age group in a time of 2:31:59. Congrats and enjoy your first SoCal Winter!